If there is one thing Texas track and field athletes don't know how to do, that is run slow. The sprinters took to two of the top meets of the weekend in the nation and they showed out. Some fast performances were produced and in the end top national times from this weekend have Texans at or near the top of the leaderboards. Find out which Texas sprinters had the best weekend. Dallas Bishop Dunne senior Cameron Miller is the real deal! The Florida signee let the world know at the Arkansas Inv with his preliminary races of 21.11. He took down the previous #1 sprinter and several other big dawgs as he made quite a statement. He tore up the track with one of the fastest indoor 200m performance by a Texan ever! I'm not quite sure what it is about the Carl Lewis Inv. that attracts some of the best hurdlers to come in and and compete every year, but it somehow seems to happen. At this meet, only the strong survive as they run three rounds before deciding the winner. Check it out as Serenity Rogers leads an outstanding hurdle final with her 8.53. Throughout the day at the Carl Lewis Inv, Deja Shaw-Huckaby and Mariah Ayers had already ran a couple of races, but that did not stop the finals showdown. Both DFW area sprinters still showed up ready to put down a fast performance. The anticipated showdown did not let down as Shaw-Huckaby would eventually win with an impressive 24.08. We knew the boys 400m record at Carl Lewis was going down this weekend and Moyo Oyebamiji made us look smart. He wasted no time as he blasted a fast first lap in the prelims on his way to take down the old record. The former record belonged to an Olympic gold medalist and similar accomplishments could be in Oyebamiji's future. Stafford senior Ryan Martin dropped a gem in his 60m prelim race. He faced a heck of a sprinting field to contend with and he matched every move anybody made. He started off with his prelim race and even a superb final race. It was the semis where he earned his US #2 6.81. DeSoto sophomore JaEra Griffin had another great race to follow up what we saw from her last week. In her finals race she blasted the field that included an Illinois state champion. Her 24.41 seems like an easy run for the sophomore but how many can make it look this easy? Nobody likes being the odd man out, that includes Katy Seven Lakes senior Lance Broome. He watched two of his club teammates come away with wins in the 60m and 400m. It was his turn in the 200m final, but it wouldn't be an easy task. The Texas A&M commit had to put on the afterburners and use all of his 6'2" frame to accelerate to the line in first place. In doing so, he ran a new meet record with his 21.53 leading Nathaniel McRae (21.68), and Caleb Boger (21.73) under the former record mark as well. 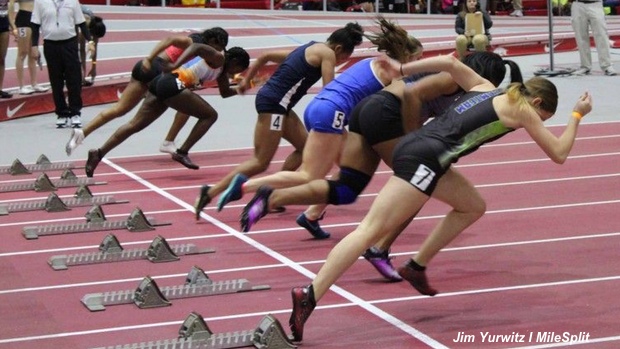 The Arkansas Inv girls 60H was a close race. With two of the best hurdlers in the nation on the same club and school team, Jayla Hollis and Jalaysiya Smith battled each other and the rest of the field as they went 1-2 with just hundreds of seconds separating 1-3 places.